It is a very nutritive energy drink. A great source of essential vitamins and minerals. It is formulated with a balanced combination of various fruits. 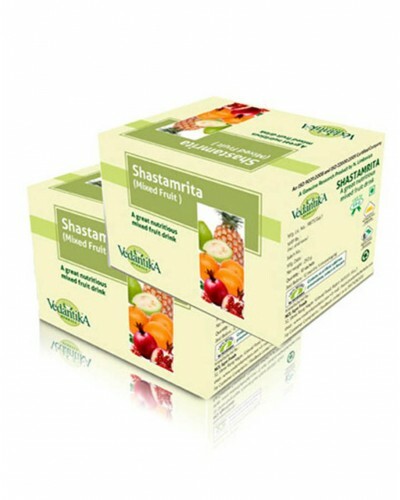 Vedantika Herbals Shastamrita Energy Drink is a natural health drink, which revitalizes and gives instant energy to the body and mind. This natural drink is a perfect blend of fruits like orange, pineapple, strawberry, guava, pomegranate, lemon and mint. Orange and pineapple are good source of vitamin C and B which increases the body immunity against common cold and other infections. Strawberry is a good source of folic acid and helps to get rid of harmful toxins from the blood. Pomegranate is also a good source of antioxidant. Guava is rich in vitamins A, B, C, carotenoids, phosphorous, potassium and iron. It helps to strengthen the digestive system. Mint and lemon are a rich source of vitamin C and also known as cleansing agent. The drink boosts the immunity of the body and protects the body from infections, cold and cough. It replenishes essential nutrients, minerals and salt of the body. It maintains a good health of the body reducing stress and tiredness. The drink is purely natural and has no side effects and can be taken on a regular basis. It also comes in great flavors and can be served as healthy mocktail for parties.